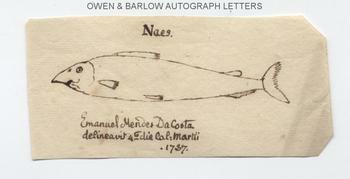 EMANUEL MENDES DA COSTA Autograph Drawing Inscribed. British (of Portuguese descent) naturalist, conchologist, botanist and collector. Fellow and librarian of the Royal Society. An autograph drawing of a fish. Inscribed "Naes. Emanuel Mendes da Costa. Delineavit 4 die Cal: Martii. 1737". On paper piece measuring approx 4.5 x 2.25 inches (11.5 x 5.5 cms). In very good condition. Emanuel Mendes da Costa was a fascinating and controversial figure in 18th century science. He was undoubtedly a fine and important naturalist, particularly in the field of marine shells (he is credited with the first use of the term 'conchology' for the study of shells) but he refused to follow the Linnaean system of classification because he percieved obscene or vulgar descriptive terms used by Linnaeus when naming certain shells that were said to resemble parts of the female anatomy. Whilst librarian of the Royal Society, Emanuel Mendes da Costa was charged with embezzlement of £1,500 of membership subscriptions. Benjamin Franklin (himself a member) attended the inquiry and reported on it to his son. Emanuel Mendes da Costa was sentanced to 5 years in debtors prison and his family were evicted from their home. He published his last book on conchology in 1778 but, with an irony that was no doubt lost on him, he failed to profit from it as a result of advance subscribers not making payment. Provenance: From the Georgian album of Anne Susanna Nichols (1788-1853), youngest daughter of the eminent printer, antiquarian and accumulator of historical documents, John Nichols (1745-1826).